This is the first of our “Dining One Year Later” look, where as the title suggests, we take a glance back at restaurants that have been open for one year and see how they’re doing. We will run this feature once every two weeks. Snapshot Verdict: Great food in a relaxed atmosphere. You could almost walk by the restaurant if you weren’t paying close enough attention. That is until you see the “Bistro La Bonne” sign, named after the owner and chef Daniel Labonne. The eponymous French restaurant opened at the end of 2009, taking over the space where the bar Axis once stood. 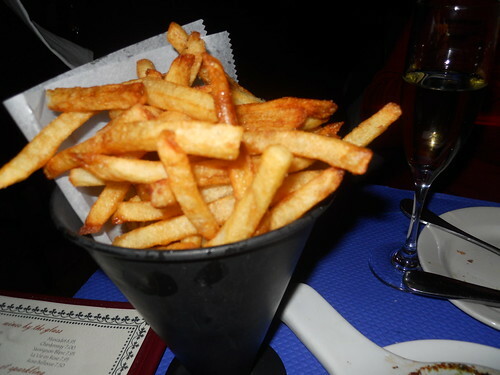 With its friendly service, steak-frites, and escargot, Bistro La Bonne has been a welcome addition to this neighborhood. Chef Labonne tells me that the 50-seat restaurant serves more than 100 people on the weekdays and 200 on the weekends. It’s a tight fit; the restaurant is narrow, though it does have a loft as well. You won’t be on someone’s lap on table next to you like you might be at Bistro Du Coin, but you won’t be stretching out either, especially if you are sitting near the bar. Speaking of the bar, it is long and perfect for watching soccer (or football as us World Cup fans would say). 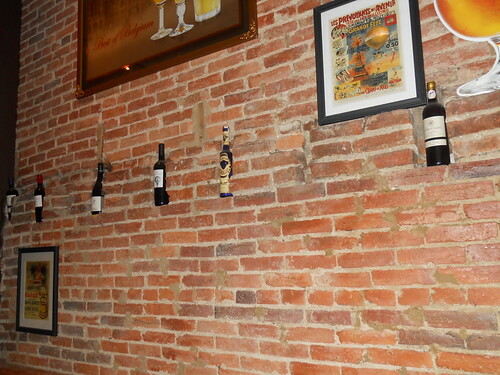 Diners will like the brick walls and pictures on display. Some gossip here — Labonne tells us he’s going to expand physically, but won’t divulge if it will just be an addition to the existing restaurant or a completely new concept. Ugh, ANC, ABRA boards here I come. I always judge a restaurant by the complimentary bread you are given; if they bread is homemade, I get excited for the meal. If the bread is store bought, I pretty much want to go home. The bread at Bistro La Bonne is warm and will keep you asking for more. My friends love to laugh at me because I LOVE condiments. My fries with honey mustard on the side often turn into honey mustard with fries on the side. Not so at Bistro La Bonne. The steak frites are crunchy, but not hard, and full of flavor thanks to a red wine sauce. 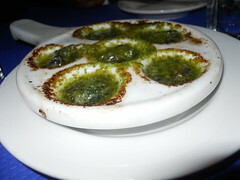 Other winning appetizers are the escargots, which other than coming out way too hot, are amazing. While they’re prepared in the expected garlic and butter sauce, Labonne must have a secret ingredient. If you want to share, have the mussels, or “moules.” You can chose from a variety of three or create your own. My recommendation is the moules provenciales, which are steamed in white white, tomatoes, garlic & herbs. 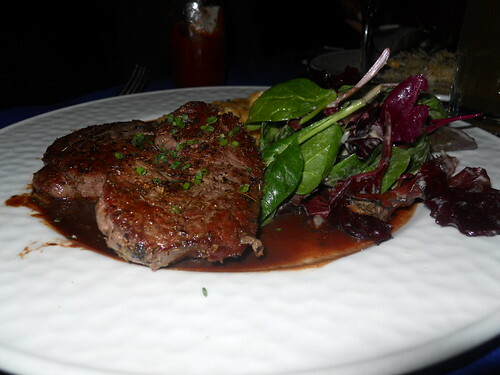 For dinner you can’t go wrong with Labonne’s steaks. The hanger steak is juicy thanks to the wine sauce it’s cooked in. The beef medallions dish comes with a shrimp risotto which is so flavorful it might just be as good as the beef. I love seafood, so I wish I could recommend the Blanquette de Fruits de Mere, in which salmon, shrimp and mussels are served in a black casserole with a champagne cream sauce. Unfortunately, this is a case of the sauce overtaking the entire dish. 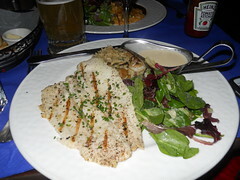 Instead have the grilled trout with white wine sauce. It melts in your mouth and has a grilled/smokey flavor. You will definitely need a doggie bag here, and you might want to get one early, because you want to make room for dessert. Go with the creme brulee or chocolate mousse cake. Labonne says he’s so happy that his restaurant is doing well and that he “couldn’t ask for more.” I have an idea for him – more sleep. Labonne became a first-time father right as his restaurant was opening, so it’s safe to say that he hasn’t slept much for one year. Here’s to changing that in 2011, Chef Labonne. Bistro La Bonne is located at 1340 U St. NW. The closest metro station is U St-Cardoza (green line/yellow line during off-peak hours). For more information, call 202-758-3413. I’ve been looking absolutely everywhere for good chocolate moose ! I was beginning to think it could only be found in Canada.